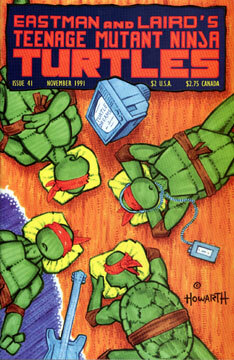 The issue opens with Leonardo dreaming of being a teenager in a high school populated by other mutant turtles. Leo is a popular athletic kid, but he’s not doing so well in class because he finds math boring. As Leo drifts off into a daydream about surfing, the teacher rudely interrupts his fantasy and demands to know the answer to a difficult problem on the blackboard. Leonardo decides that he doesn’t have to put up with this sort of thing, as it’s his dream and he can do what he wants. The teacher then morphs into a gigantic lobster-like monster and attacks Leo. After a short skirmish, Leonardo vanquishes his foe and returns to his seat, happy and consoled that the substitute teacher will be much easier to deal with… but as it turns out, the substitute is a Tyrranosaurus. On the last panel we see a smiling Raphael, content in his battle frenzied dream. Donatello is sleeping on the couch after eating an entire bag of chocolate-chip cheese cookies. In Don’s nightmare, the Feds have captured the TMNT and subjected them to all kinds of nefarious tests and tortures. As the Turtles endure their treatment, the top secret government file regarding them is stolen and sold to a Hollywood producer, who decides to exploit the TMNT for his own commercial gain via cartoons and toys. The cartoon and toys became a huge hit, but the Turtles, still captives of the government, knew nothing of the events. Eventually the Green Team is set free when the branch investigating them is shut down due to lack of funding. Thus the guys are able to return to their lair and fight crime like they once did. However, now that the success of the cartoons and toys has made them celebrities, they’re constantly surronded by adoring fans and can no longer battle evil. Don seeks Splinter’s advice, but the sage old rat has no answers… thus the TMNT become prisoners of their own fame and lay around watching TV all day, getting lazy and fat. Master Splinter is meditating and allows himself to dream of visiting an expensive restaurant. The Sensei is sharng a table with celebrities Akira Kagemusha, Albert Einstein and Alfred Hitchcock, discussing existential philosphy. Mike has fallen asleep listening to his Walkman and dreams of being a Rock n Roll star. During his concert, he is attacked by Dr. Vox and his cronies, who hate Rock music and want to see it abolished. Mikey battles them to no avail, but he’s saved when his fans race to the voting booths to silence the protests of the cencorship minded Dr. Vox.